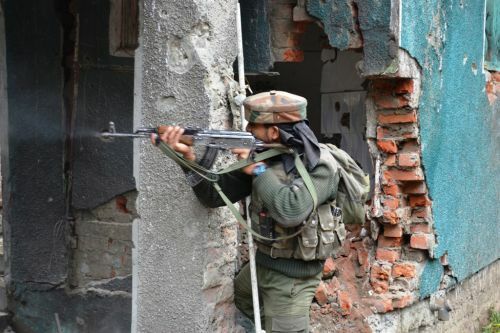 A policeman has died in an encounter that erupted early Sunday morning between militants and the security forces in the Poonch district of Jammu and Kashmir. According to the security officials, one terrorist has also been killed in an ongoing encounter. Reports said that firing broke out near the Army’s 93 Brigade headquarters around 7.40 am. The encounter comes after two civilians were killed – one by tear gas shelling and another by pellet gun shooting – as they participated in protests in Kashmir that has been under a cloud of violence ever since the death of Hizbul chief Burhan wani’s death. Kashmir has witnessed curfew for the past 65 days during which 75 people have died and thousands of others have been injured.